I've been doing a lot of reading from the forums from a few years ago about osteodystrophy. I didn't know anything about it before this week except for hearing about a few links between it and satin piggies. 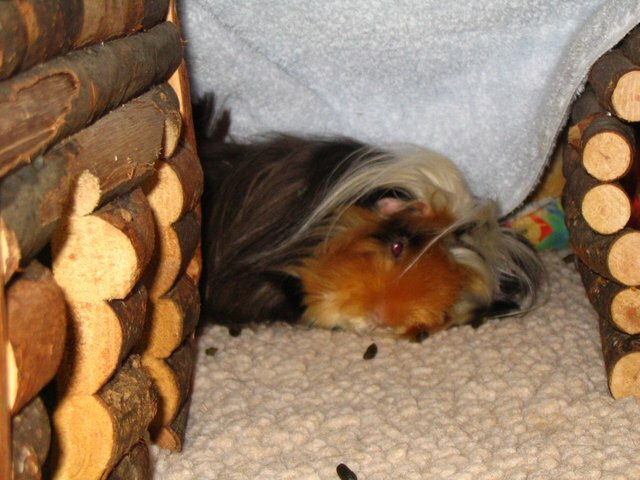 I just found out that my 2 1/2 year old satin Peruvian boar (Zeuss) may have osteodystrophy. He has been hopping instead of walking, had some weight loss lately that seems to be accelerating, rests on his side in weird positions and squeals a lot when you pick him up. I took him to our vet that I've been using for him since he was a pup. She took a full xray this week and it looks like he may have osteodystrophy. She is going to consult with a radiologist to confirm. She hasn't treated osteodystrophy before but she is very good about researching when needed. She is now out of town until Thursday(5 more days). We also use Dr Nakamura but he is out of town for two weeks. We started Zeuss on Metacam -.2ml BID - but he is still in a lot of pain and not eating much. He's lost about 75 grams this week. I've tried syringe feeding him Critical Care but he squeals a lot during this and I'm not getting much in. Most of the posts about osteodystrophy on here are from 3 years ago so I thought I'd check to see if there is new information. It seems like some have had success using calcium lactate supplements along with full-spectrum light or daylight. Any other ideas? 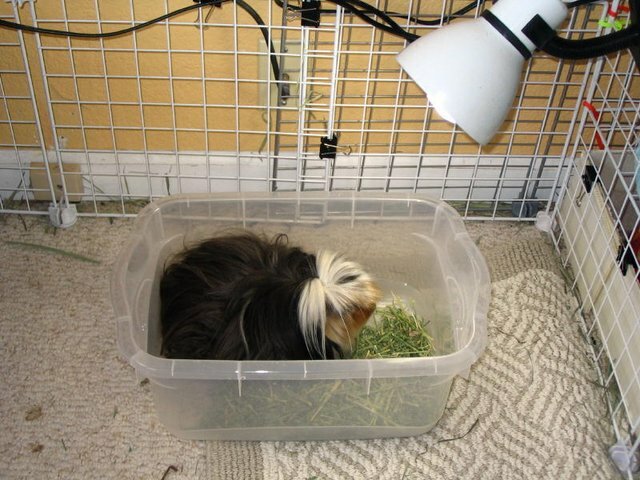 Are there other guinea pig vets in the San Francisco bay area who treat osteodystrophy? Or should I start with the suggested calcium lactate and wait for my vets to return? Zeuss isn't moving much - he's on his side a lot. Have people had success reversing it when it's this advanced? I hate to see him in so much pain. Thanks - Sorry for the length of this post. On a related note, someone called yesterday and wanted to surrender a red satin male guinea pig to me. I normally don't take in owner surrenders since the shelters keep me plenty busy. But I'm a bit worried since this piggy is a satin. What do other rescues do about satins? Do you keep them as sanctuary pigs so you can watch out for OD? Or do you find cavy-savy owners who can watch for this? Is it hard to place them since the owners could be facing large vet bills? Not all satins come down with OD though they are prone to it. If they do get it, it's a life long management issue. It's recommended to get a baseline x ray each year to monitor any possible bone depletion. I wouldn't necessarily keep them as sanctuary pigs unless they have proven medical issues. Rusty in my avatar was a Satin. I kept him til he passed away a few months ago but he had other things going on and was really neglected when I got him. The calcium the Satin pigs' intake goes to their coat from what I understand. If your guy is a peruvian with a long coat, that may not be helping him. Pinta and Mum have some experience maintaining Satins with OD. Yeah, some breeders deny OD exists and I don't think much studies have been properly done. Maybe CP knows more. CavyHouse, yes, natural vitamin D (light) and calcium lactate can help. So long as there are no issues with stones (an xray would have turned them up), personally, I would go ahead and start supplementation. You might be able to get calcium lactate with D (it's needed for calcium absorption). Would it be wise to supplement any satin, even before they start with problems? As someone with a stone pig, I wouldn't want to supplement calcium lactate without some kind of evidence of OD but perhaps a full spectrum light would be appropriate for all satins instead. It would encourage calcium absorption without the risk of urinary side effects. I had consulted with my vet Dr Nakamura regarding my satin pig Derek (my avatar) when he was about one and a half- two years old to see what we could do to prevent bone density loss and his opinion was to just monitor by xray. No supplements were recommended. We took a baseline xray sometime in either late 04 or 05 I think, which determned Derek had a very slight (he could only see it on the xray using a magnifying glass) bit of bone loss in his knees and back, but not specifically in his spine area which is if I recall correctly, would have been more significant/concerning. Dr N's plan of action was to take an xray every six months to see if Derek's condition worsened, which it did not until his death in Oct 06 from other causes other than bone loss. I have a pig here who came in with very severe boneloss. On the xray his whole back end looked like cottage cheese. I started him on 75mg calcium lactate twice daily and put a reptile lamp over his cage. 18 months later an xray showed his bones were remodeling remarkably. I kept him on 0.15mg metacam daily as a maintenance dose. I reduced his calcium lactate to 75mg once daily. It's now been a further year, and I haven't yet re-xrayed him but recently I found I was able to stop the Metacam with no obvious effects. I would never supplement calcium without good reason - i.e. OD shown on xray. A baseline xray is always useful with satins. I would adopt out a satin with clean xrays, but be sure the owner is aware that yearly xrays are recommended. Apart from the cost of xrays, this disease is inexpensive to manage - merely the cost of calcium, metacam, and a reptile lamp. Thanks everyone for the advice. I'll start him on calcium lactate and sunlight - I have a light that isn't a reptile light but might a full spectrum light. If it isn't I'll get a reptile light for him. I was reading on here about mixing the calcium lactate with Odwalla Superfood. Is that the best way? The original studies I was reading made it sound like 100% of satins get it but it sounds like it may not be that bad? Also - how much each day do you use the full spectrum lighting? Thanks for the advice on the owner surrender piggy and the treatment suggestions. You have to get the holder for it. I usually order my replacement bulbs (once a year) from Big Apple Herp. I actually get my calcium lactate compounded. It's a real pia to disolve when you do itself. But, yes, before I got it compounded I mixed with the Odwalla. You have to warm the stuff, or it just goes goopy! In the winter I leave the light on all day, since the pigs like to bask under it (it goes over the hayloft). In the summer I leave it on for 10 mins morning and night. Are you going to take in the red satin male? Is he a short hair? But I would need about up to two weeks to coordinate to get to you to get him since I'm currently carless and may need to wait until weekend after next to get him from you. (I do have an emergency ride lined up from a friend for any pig emergencies at any time thank god). I just happen to have a spare 2 x 3 so I can quarantine/keep him in after his neuter. But of course if someone wants him right now than that's great too that he gets a forever home sooner. Dr. Nakamura treated my Elvis, so he's very much aware of bone density loss. He has a thread I'll look up for you. With the metacam, he should do OK until Dr. N. returns. I don't know of another vet in the Bay Area that I'd trust to deal with this. We most certainly reversed Elvis' bone loss which was considerable, along with joint issues. It's really important to go about this carefully. Elvis developed a stone in his ureter and I still regret not decreasing the amount when Dr. N. recommended it. Ditto on the full-spectrum lamp. I also fed Elvis alfalfa. Here are a couple of pictures. The first two show how he used to lay in very strange positions. The third one is his alfalfa/tanning booth. Those are the positions Zeuss lies in too... It makes me feel encouraged to know that you were able to reverse it from this stage. Piggster - If you're serious about possibly wanting the red satin male, that would be great. I can put you in contact directly with the person who contacted me. They live in Oakland and I'm in La HOnda. If your contact information is current (San Bruno) then you're actually located half way between Oakland and La Honda. The person was going to deliver the piggy to me so I'm sure they wouldn't mind not having to drive all the way to La Honda. Let me know and I'll PM (is that the right term??) the contact information and introduce you via email to the person looking to rehome the piggy. I would love for the satin to go to someone knowledgeable about their potential problems. Piggster - by the way, you probably know this already but you can get piggies neutered at Palo Alto Animal Services for $40. 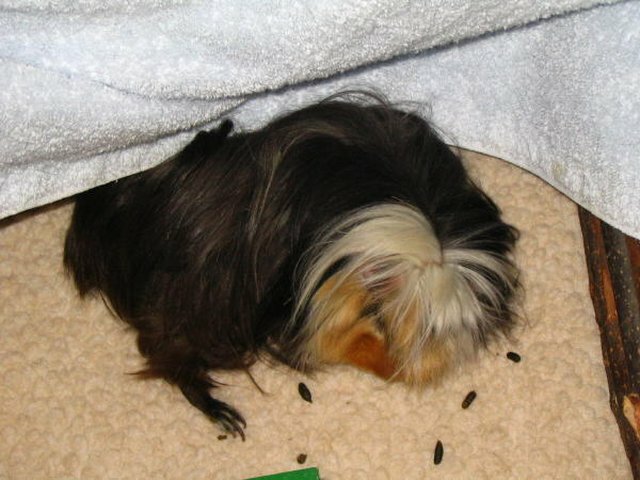 Dr. Bonnie Yoffee does the neuters and she has done tons of neuters - I think Cavy Spirit uses them too?? But the people looking to rehome the piggy have offered to contribute towards the neutering so the price may not even be an issue. Sue, I would think it best to have the light in a spot where he can easily move in and out versus confining him in that box. Yes, he'll get less overall exposure that way, but if he gets warm, he can move and go get a drink of water. Remember that even though you supplement with calcium, the body needs either vit D or PTH to absorb and use this calcium. Ask about giving calcitriol (active vit D) to go along with the calcium supplement. Especially if the pig has some sort of renal insufficiency (remember that bloodwork will not reflect abnormal values until over 75% of the organ has been compromised), since the kidney is responsible for almost all of the activation of vit D, the pig may not be able to absorb calcium too well. The body then produces PTH (parathyroid hormone) to fulfill this job... however, this can lead to hyperparathyroid in the long run. Watch for Ca:P ratios too. You don't want urolith formations, as becky pointed out. Sorry, nutrition and bone stuff is not a strong point for me. Mum's idea of using a sun lamp is also a good idea. Vit D is absorbed mostly through sunlight. Oral absorption is pretty poor in all species. D is also a fat soluble vitamin so it's possible to overdose. Yup. Though oral absorption is pretty poor. Most of it just passes. Sunlight is probably a better option.